I was able to listen to this while doing other menial tasks, which made this a lot faster than sitting down to read. In terms of the content it's a great book to learn how others have learned to work smarter to get to their goals faster. 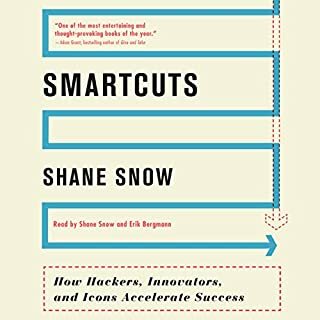 Shane Snow's explanation of theories with every day examples of people who have succeeded with these techniques is super engaging and refreshing. The examples brought it home for me. Specially when he concludes with Dwayne Edwards story. Have you listened to any of Shane Snow and Erik Bergmann ’s other performances before? How does this one compare?